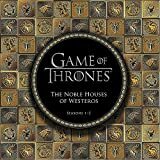 The perfect holiday gift for fans of A Song of Ice and Fire and HBO’s Game of Thrones, this collection of full-color maps is stunningly illustrated and ideal for framing. 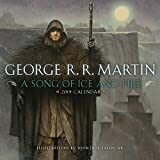 George R. R. Martin’s beloved series is bursting with a variety and richness of landscapes—from bitter tundra to arid wasteland and everything in between—that provide a sense of scale unrivaled in contemporary fantasy. Now this dazzling set of maps, featuring original artwork from illustrator and cartographer Jonathan Roberts, transforms Martin’s epic saga into a world as fully realized as the one around us. Never before has the entire scope of Martin’s universe been so exhaustively and fascinatingly depicted. The maps in this beautiful, one-of-a-kind collection will enrich your reading or viewing experience, provide another view of your favorite characters’ epic journeys, and open up captivating new worlds—plus, they’ll look great on any castle wall.